This is our heated and lit room. It is so very nice to have somewhere we can sit comfortably, be warm, and read. Once we have run out of books, the sofa turns into a bed, and we can sleep in a room where we don't awake covered in frost. This is a step in the right direction. You can see, however, the effect that putting heat into the house for the first time in many years is having - the dark patch on the wall is moisture. In the meantime, we are still waiting for a house in Australia to be sold - papers have been signed, but the dates keep getting further and further away. Once the house is sold, the frenzy of work will recommence. Keep watching this space! 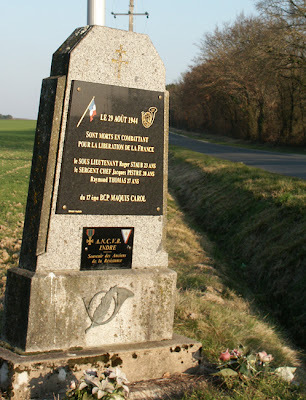 On a quiet crossroads between Martizay and Yzeures-sur-Creuse stands this small war memorial to three members of the Maquis (French Resistance. Roger STAUBB, Jacques PISTRE and Raymond THOMAS were killed in combat on the 29th of August 1944. This was 4 days after the liberation of Paris, and the day of the American Victory parade down the Champs Elysees (the French liberation parade was on the 26th of August). I can't find any details of what happened on a quiet road in rural France 4 days after the Germans in Paris surrendered, but I suspect that the proximity of the railway crossing may play a part. Si vous savez n'importe quoi à propos de ce mémorial svp faites-nous savoir. Robert Johnson sang "I went to the crossroads, fell down on my knees". 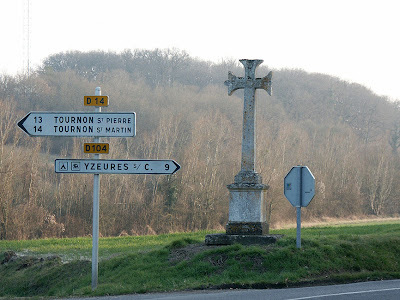 In France, many of the crossroads have crosses on them for exactly the same reason Robert Johnson fell on his knees - it's where the devil appears with the intention of tempting people. Most of the crosses in our part of France are pretty unimaginative compared to some other regions, the best we have seen being in Deux-Sevres. There the crosses include life sized fibreglass crucifixes on top of a mountain of millstones and other such delights. Our local crosses are usually either concrete or cast iron. The cast iron ones are sometimes quite ornate, the concrete ones are very staid. This is one of the latter. Damselflies are small members of the order Odonata, first cousins of the dragonflies, who are also Odonata (which means 'toothed jaw'). Damselflies are finer and less robust than their kin and their flight muscles are less developed, allowing them to rest with their wings folded neatly above their bodies. Approximately a third to a half the Odonatae are damselflies, or the sub-order Zygoptera (meaning 'paired wings'). There are currently about 25 species that can be seen around Preuilly-sur-Claise; compared to about 20 species in the whole of Britain; 30 in the whole of France and at least 100 species in Australia. Banded Demoiselle Calopteryx splendens In French le caloptéryx éclatant (ie brilliant or flagrant). The scientific name echoes this theme, meaning the shining beautiful wings. So, we are all agreed then - this is a dazzling creature. You usually only see them close to rivers and they are often common and extremely visible, flapping lazily about taking frequent rests on long grass, overhanging twigs or lily pads. Well - the metallic navy blue males (above, top) are frequently seen. 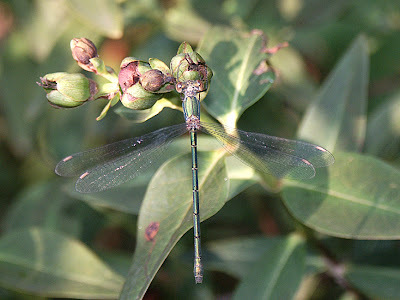 The equally metallic emerald green females (above, bottom) with their yellow cellophane wings are much more low profile. The species likes open running water, but not too cold, not too fast and tumbling, not too big in surface area, not too high above sea level, and not too shady. The pictured male was taken on the riverbank at Yzeures-sur-Creuse on an extremely windy day in June, so he was struggling a bit with the conditions - clinging on for dear life, as close to the ground as possible, in the hopes of lessening the buffeting. All around him, poor little newly emerged Featherlegs (see below) were being blown sideways across the sports field like little bits of straw at harvest time. The female is from the same month and we met her in the grounds of Chenonceau - clearly keeping up the château's association with beautiful ladies. Around Preuilly-sur-Claise they can be seen from May to September. For more about Demoiselles, see my previous posts here. Migrant Spreadwing Lestes barbarus Known as the Southern Emerald Damselfly in Britain and le leste sauvage in France ie the 'savage predator' (the scientific name means the same). The English names all reflect very noticeable features of this species' life cycle and appearance: it is strongly migratory, reaching Britain every couple of years these days; it has the typical Spreadwing habit of perching with its wings held loosely open; its range covers the whole of southern Europe (and more, as it is becoming increasingly common in the north); both sexes are an elegant combination of metallic emerald green and cream. The species is unusual in that it prefers ephemeral sites and is more often than not seen in places that do not seem promising as breeding sites, such as meadows that dry out in summer. 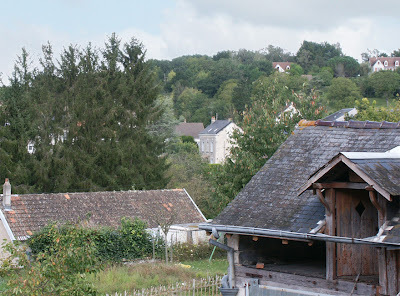 The female pictured (above, left) was photographed in June near Roux, a hamlet just outside of Preuilly-sur-Claise. It was resting on Common Gorse Ulex europaeus at the edge of a flowery fallow field at the top of a low hill. The male (above, right) was photographed nearby on the same ridge - note the pale hooks at the tip of the abdomen, used for clasping the female when mating (both upper and lower appendages are visible if you click on the image to make it full size). The species can be seen from May to September and is common in the area. Western Willow Spreadwing Lestes viridis Known in Britain as the Willow Emerald Damselfly and in France as le leste vert - so the British, French and scientific name all tell you that the creature is green. This is the Spreadwing most likely to be seen in gardens in France and can be seen from July to October in the Touraine and Berry. It is one of those species that has benefitted from urbanisation because of its preference for permanent ponds bordered by trees or bushes - parks and gardens provide this habitat in abundance. They are common and usually found hanging in bushes, just as in the picture of the female above, which was taken in le Petit Pressigny in August. The species can be distinguished from other spreadwings by its pale pterostigma, which are terracotta pink once the damselfly is mature. Males also have surprisingly noticeable white upper claspers at the tip of the abdomen and inconspicuous lower appendages (other species have darker upper appendages and/or long lower appendages). Common Winter Damsel Sympecma fusca Known in Britain as the Winter Damselfly (although it has never been recorded in Britain). The French name is le leste brun ie the 'brown predator'. The specific name also translates as 'brown'. I love this species. It is extraordinarily cryptic, morphing in and out of view like a shapeshifting wraith or CGI special effect in a movie. 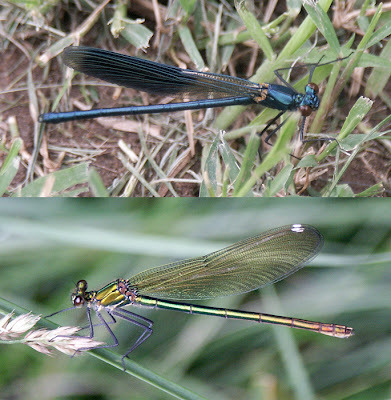 The Winter Damsels are the only European genus which overwinters as an adult, and as a consequence, can be seen all year if the weather is sunny. This male (above) was photographed on the edge of an area of wooded heath on la réserve naturelle de la Chérine in July. They are common over much of Europe, but because of their superb camoflage probably often overlooked. Presumably due to climate change, the northern limit of their range is extending rapidly. They have a preference for well-vegetated standing water with floating dead reeds. Common Bluetail Ischnura elegans Known as the Blue-tailed Damselfly in Britain and l'agrion élégant in France. As you can see, the name themes here are elegance and blue tails. That blue tail certainly is noticeable. A male, floating over the dark background of deep water, can be almost invisible except for the astonishing neon blue of abdominal section number 8. The females are much more subtle and varied and can be either blue, lavender, green or pale pinky orange. In this picture of a mating pair (above, left) taken at Champigny-sur-Veude, you can see how the female is being gripped behind the head and curling the tip of her abdomen up to the male's secondary genitalia. You can also clearly see the pretty 2-toned pterostigma that is a feature of this genus and helps to distinguish it from the other blue damselflies. This species is one of the most common and widespread in Europe and can be seen from April to September in most places. Unusually tolerant of very eutrophic* sites, it is normally the dominant species in such places. The picture above right is from la réserve naturelle de la Chérine in July, and I'm afraid shows the predator predated: a Robberfly Asilinae hunkering down over her lunch and looking suspiciously up at us, exactly in the manner of a dog with a bone who is afraid you are going to steal it. Life and death on the nature reserve, eh? Small Redeye Erythromma viridulum Known as the Small Red-eyed Damselfly in Britain and la naïade au corps vert in France. The scientific name translates as the 'greenish water-nymph' and the French is similar ('the green bodied water nymph'). 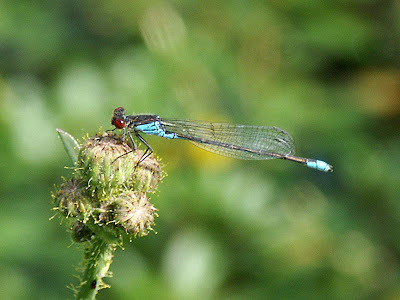 This species is often seen much further out over the water than other species of blue damselflies, sitting on emergent aquatic vegetation some distance from the edge of ponds or slow flowing rivers. 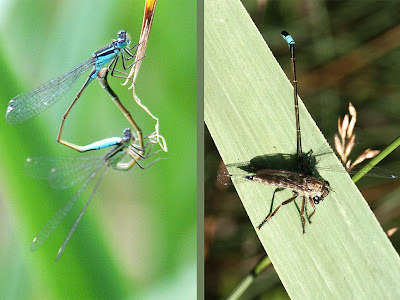 As you would expect from a species that habitually leaves the safety of the shore, they are swift and powerful flyers in comparison to many damselflies, and over the last 10 years have colonised the south east of England. They could be confused with the Common Bluetail, which are about the same size, but they are charcoal grey rather than the lustrous black of other blue damselflies, and both the red of the eyes and blue of the thorax and tail tip can be seen from some distance away. This male (above) was photographed on the riverbank at Bossay-sur-Claise (the village just upstream from Preuilly). They can be seen from May to September in central France and are common. Blue Featherleg Platycnemis pennipes Known as the White-legged Damselfly in Britain and l'agrion à larges pattes in France. The very pale blue males (see picture above left) have very obvious white 'feathered' legs. Note also the pincers at the end of the abdomen for gripping the female when mating, which you can see in action in the picture on the right. For a better view of the feathered legs, see a picture from a previous post here. The scientific name means 'flat feathery calves' and the French name also highlights the broad legs. 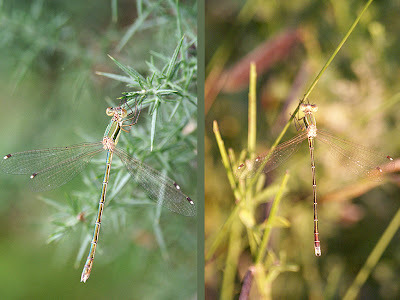 It is by far the most common Featherleg, characteristic of sunlit lowland floodplains and rivers, and can be seen from May to September. 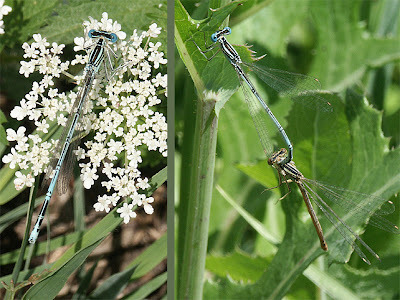 The most likely confusion would be with teneral (immature) specimens of other blue damselflies. 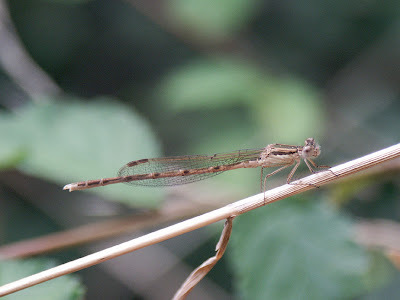 Although they are actually quite large and robust as damselflies go, their ghostly colouration gives the impression of something ethereal and delicate (or if you are feeling more prosaically inclined, something feeble and ailing). Watch out for the males displaying by bouncing and fluttering in the air whilst dangling those fine feathery legs. They are very susceptible to pollution and their disappearance from an area can often be a sign of problems. Finally, enjoy this offering from French animators, Miniscule TV. It is a shame that it has been over compressed so the quality is rather poor, but amusing nonetheless. If you liked it, you can find several more of their little vids on YouTube. *Water having such a high level of dissolved organic nutrients that it is more or less devoid of oxygen. A particular problem of water bodies in agricultural areas because of fertilizer runoff (both artificial and natural). 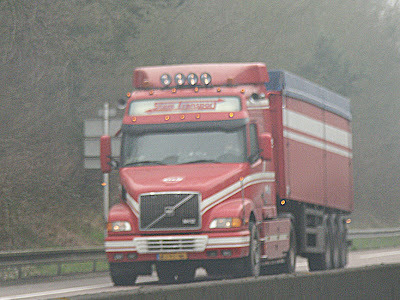 Driving on the Autoroutes - especially if you're not totally used to driving on the right - can be pretty disorientating. 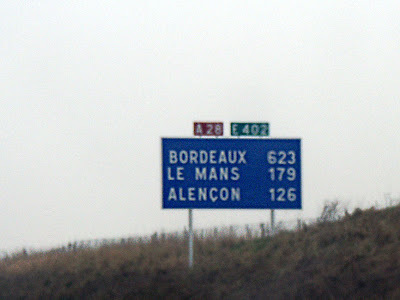 The French manage to add an additional twist to the situation though; distances shown on signs may not be what they appear! The problem is that when you see a sign saying "Le Mans 179", it means Le Mans may be 179km away but only if you take the shortest route. If you stay on the Autoroute you are on it is likely to be a fair bit further. There are even cases where you can see a sign giving distances to a place - and 10km down the road see another sign saying you are further away from the place you are heading to than when you started. This is particularly noticable around Rouen. 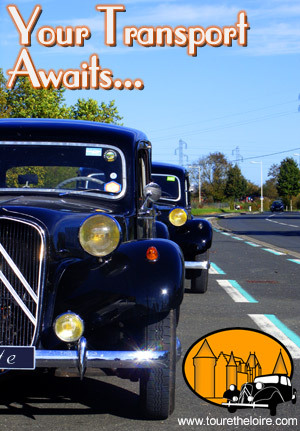 There is a way to know how far you have yet to travel on an Autoroute before you reach somewhere, but only if that place is the end of that particular road. In the middle of the road on the concrete divide there are signs giving distance to (or from) the end of the Autoroute every kilometre (and sometimes every 200 metres as well). This is fine as long as you know where the road ends. On the A28 the signs (in both directions) show how far from Tours you are. Of course, on the railways it is different; not only do they drive on the left, but the distance - to Paris - is always accurate. Sainte Maure de Touraine is the name of a town about 50km from Preuilly sur Claise. 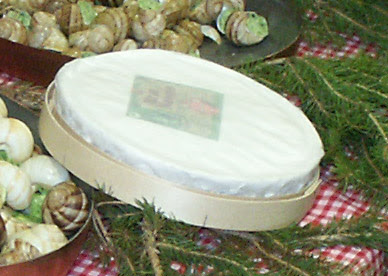 It is also the name of one of our local chèvre (goats' cheeses), the other being Pouligny-Saint-Pierre. 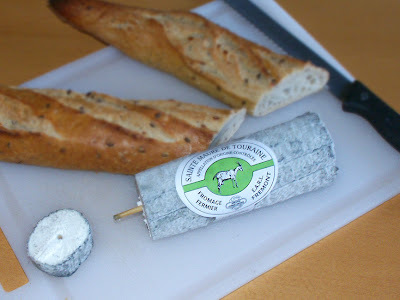 Luckily for us, although I am not a much of a fan of chèvre, I really do like Ste Maure. Ste Maure de Touraine is an AOC (Appellation d'origine contrôlée) which roughly follows the boundaries of the old Province of Touraine. It has to be made by traditional methods - this just about means that all the cheese is made by hand from fresh ingredients, either on farms or in dairy co-operatives. 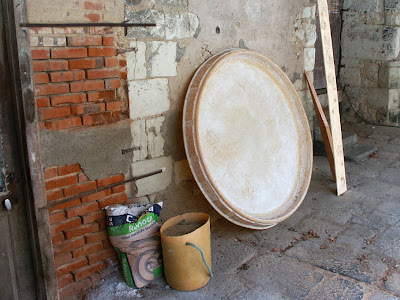 There is an industrial version made in the same area, but this is called Ste Maure (without the Touraine bit). Our nearest farm is about 5 km from us on the road from Preuilly and Charnizay, and they won a Golden Goat for farm produced Sainte Maure in 2005. The cheese is made in the shape of a log about 17cm (7") long and has a rye straw running through it to help roll the cheese as it is being formed support the cheese log as it is rolled in salt and ash. The straw is stamped with the name of the maker and the tradition is to use a knife that isn't too sharp to cut around the straw so it is left in the cheese. The industrial version doesn't have the straw. There is a website with more information here. We have just returned from a weekend and a bit in Preuilly. The main reason for going was to visit the Foire au Safran, which is one of the village's annual festivals. This was our second Foire, as we also made the effort last year. This year's fair was slightly smaller but no less interesting, with a display of local produce (including saffron), arty stuff (glasswork, pottery and basket making) and patronomie. We met and spoke with the people from the history and archaeology society, who appeared delighted to meet the people who had bought "the house with the beautiful carved stone over the doors". The president of the society says it is an interesting house, and knows some of its history. 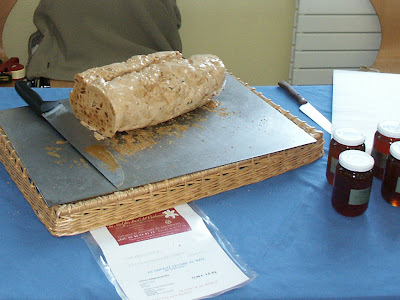 He was also enthusiastic about being allowed to see inside the house, but we fear it may be a disappointment for him..... Susan will be writing more about some of the stalls later, but my favorite was the nougat stall. On the evening of the Foire the local restaurants all have special safforn flavoured menus. As we did last year, we ate at L'Image. Jean-Michel once again managed to surprise us with his imaginative blend of ingredients and flavours and we had a great evening. When we arrived at the house our water was turned off. We had assumed that the builders did this when they left in Spetember, but it now appears that during October the old gas water boiler in the kitchen sprang a leak and caused a stream in the street which the commune halted by turning off the secret tap buried in the middle of the road. 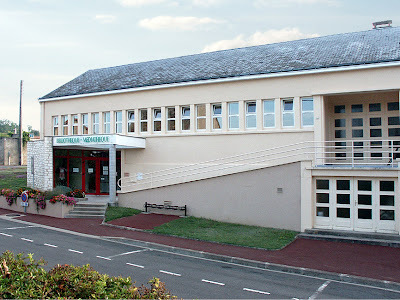 We had to visit the Mairie to arrange the resupply, and then organise a visit by the plumber to remove the offending item. We had also arranged for Rob the electrician to visit and install some prises (plugs) so we can use electricity in the house without having to start the generator. 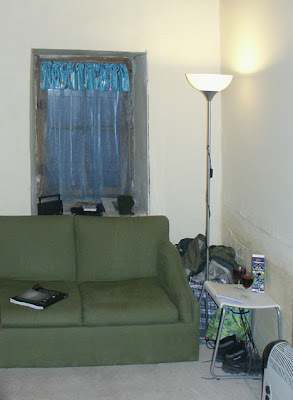 We can now light the house and heat one small room, making life a lot more comfortable. Staying in the house and not being cold whilst all around is frosty is a great feeling. At the Foire we ran into Pierre-Yves and Sylvie, two of our neighbours, and spend a very pleasant afternoon looking at their house. They had to wait until M. Galland finished our roof before starting theirs, which was a little embarrassing because they had been waiting longer. 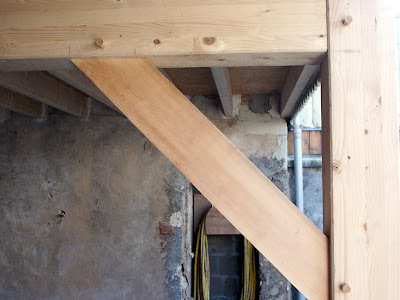 They have a complete new roof on a pegged wooden frame, the difference between their roof frame and ours being that because huge oak beams are no longer available the beams are composites made with pine. It is still impressive seeing a new roof made in the traditional style, however. We were also offered the use of their laundry tap until we had our water turned on again, which was most kind. We also managed to remove the last of the demolition rubble from my attack on the staircase and the "dry" lining of the salon (which, interestingly, our elderly neighbour refers to as the salle à manger). .....or the Ancient and Vulnerable game of Norbert. (Vulnerable because the rules are always likely to change). On a long trip, amusement is sometimes hard to come by (yes Katherine, even growed-ups get bored) and over the eons the game of Norbert has developed. We recently found a copy of the rulebook, and have translated it from French Elvish into English. 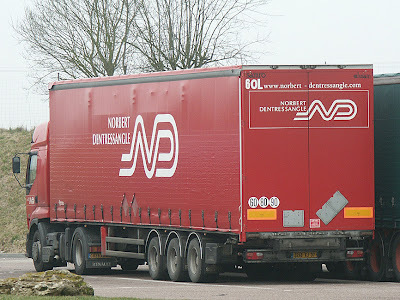 The game of Norbert is played by two or more players. As soon as a Norbert is spotted a player calls "Norbert", thus gaining a point. If it transpires that the call has been made erroniously (a Not-a-Norbert), the player loses a life. Each player has five lives. An additional point is awarded if the Norbert is bi-coloured. The player calling "Norbert" does not have to identify what sort of Norbert it is when calling, this is done in agreement with the other players. If the call is made too late for other players to agree upon the value of the call, one point is awarded no matter the variant. Disputes are settled by the Senior Female saying "If you two don't behave............."
There is a version on this game (the Vingt/Vingt Variant) where Not-a-Norberts are also worth points. In this case, lives are lost if a Not-a-Norbert is called as a Norbert or vice-versa. 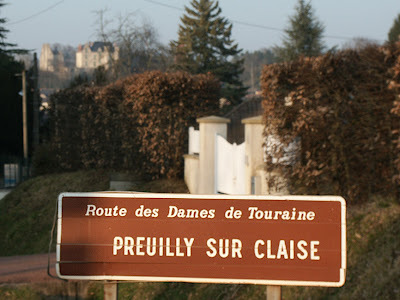 The name of our town, Preuilly sur Claise, is not a particularly easy stretch for the English speaking tongue. Theoretically, it should be pronounced something like 'prer-ee syur klez'. Ideally, one should blend the two syllables of Preuilly so smoothly that they almost sound like a single syllable - 'pruhee'. I have had my pronunciation corrected when I have articulated too carefully. The stress, as is usual with French, is fairly even, but slightly stronger on the first syllable. Of course, the town is often just referred to as Preuilly, but you need to be a little bit careful - there are a number of towns called Pouilly (pronounced more like 'pooey' and seen on the labels of some very nice white wines) and about five towns in France called Preuilly. The first time we arranged for a builder to look at the house and give us a quote, he ended up in a town about 100km distant, and there is Preuilly la Ville, only about 20km away, in the Brenne. The name Preuilly comes from the name of a Gallo-Roman owner of a villa on the site of the town. Don't be fooled by the title of the blog. 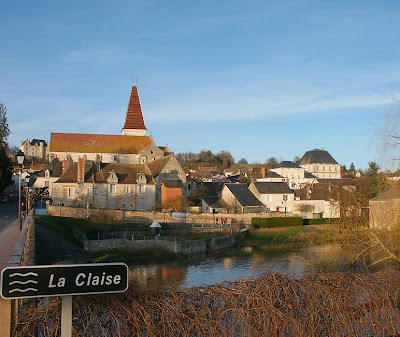 If you say 'Claise' as if it were an English place name, the blog title contains an assonant rhyme, but in French it is pronounced differently and is less effective. Don't be fooled into thinking I am any sort of authority on French pronunciation, either. I can just see the wry French smiles on reading this! I have had several French friends comment that English speakers don't move their lips enough. It is true - in English, the lips bob gently up and down and the face can remain as non-committal as one likes; but with French, the mouth is one second stretching taut back towards the ears and the very next syllable is coming out in a pout. Maybe this is just too demonstrative and unnecessarily melodramatic for many English speakers to feel comfortable with. 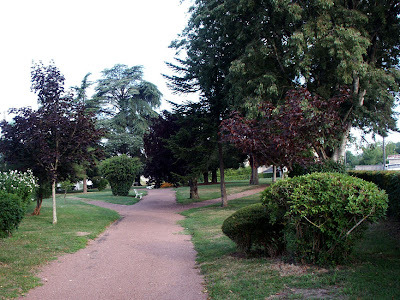 Opposite the bibliothèque is a garden. Arboretum is too grand a word for it, but it has half a dozen 'arbres notable' (notable trees). 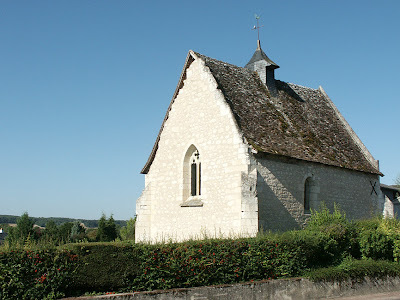 Originally the garden was a graveyard and the now disused and rather crumbling 15th century building (below) that sits in the top corner by the road to le Grand Pressigny was its chapel (chapelle de tous les saints). In the garden, planted as close to each other as is feasible for two such large trees, there is a Cedar of Lebanon and an Atlas Cedar (the far grey-green tree, below) as well as Yew, an extremely robust looking Berberis (in the middle, below, near the seat), and a Common Lime (bottom, on the left) by the entrance. The other two arbres notable, Celtis australis (in the middle on the right, above and below) and Spanish Fir (below, behind the Celtis) resonate in particularly personal ways for me. Despite its name, this Celtis is a European tree, 'australis' just meaning 'southern'. In my parents' front garden in south-east Queensland, Australia, there is a very similar looking mature Celtis (in this case, an Asian cousin I think). Although, to be frank, Celtis is nothing out of the ordinary to look at, it is tough and well able to handle drought. Perhaps in some way compensation for its plain looks though, around the world Celtis is the favoured food plant of the caterpillars of some rather showy butterflies. Sadly, we are too far north for the Nettle Tree Butterfly in Preuilly, but some years my parents' tree nourishes a small number of Tailed Emperors . Finally, there are two Spanish Firs, Abies pinsapo, planted close together in the garden in Preuilly. This provoked a memory from my childhood, as in a paddock by the house on my father's family farm (now sold and and the land subdivided for housing) near Geelong, Victoria, there stood a tree that I remember being told was Spanish Pine. I was never able to identify it for sure, but I wondered if perhaps it was Spanish Fir, a species endangered in its native Spanish mountains. Of course it may well have been something completely different. A link giving pictures and details of the trees in the garden is here. The last post was about the bibliotheque. This entry is being posted from there. For a small town, Preuilly has a really quite good library. Small but perfectly formed would be a fair description. Along with the books and magazines (including a selection of English novels) is a media centre with four computers which are connected to the internet, and a printer. For 12€ a year this is really quite good value, and has come in handy more than once. Susan and I joined last February. The library is open Tuesday afternoon, and all day Wednesday and Saturday. The website is here. 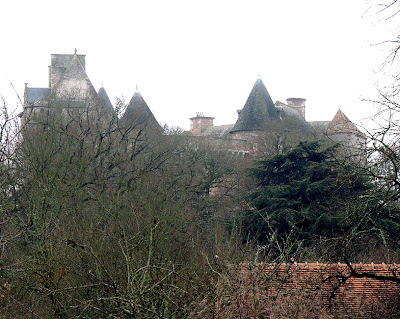 Another example of the 'Gormenghast effect' that many medieval French château have. 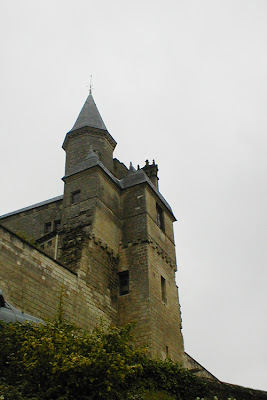 This one is a turretted tower on the corner of the curtain wall at le Grand Pressigny. Inside the grounds is the musée de la préhistoire, reopening this year after a closure for refurbishment,and well worth a visit. It was warm when we had the roofers in. Although the mornings were quite cool, the days heated up until it got to the stage where it was shirts off whilst on the roof. I was surprised, though, that they were so prepared for this that they bought their own paddling pool to cool down in. Yup - I know what it is, but do you? No prizes for unimaginative guesses. In fact - no prizes at all. 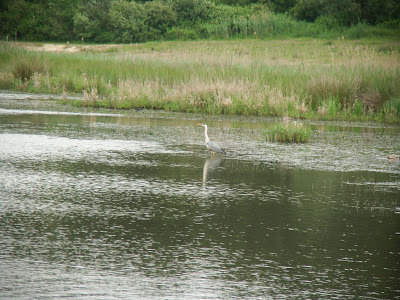 The Brenne has a temperate maritime climate, for all it is 200km from the sea. The prevailing winds are from the west or south-west ie from the coast, bringing most of the rain and generally scooting along fairly smartly, with gusts regularly recorded of 70-100km/hour. Winds from the north or north-east are coming from Scandinavia or Russia and are cold. The average annual temperature is 11°C. Winter gets 60 days of frost and the average temperature is 4°C. The temperature rarely gets down to -10°C and winters are generally mild (by European standards). Although it can frost into May, on the other hand, the days get warm very early in spring. November to February receives 50-90 hours of sunshine per month, increasing to 250 hours in July. On average there is 2000 hours of sunshine annually. This is quite a lot of sun - compare with London, which averages 1200 hours annually, and Sydney, (although by no means the sunniest Australian city) which gets 2500. Rainfall is relatively evenly distributed throughout the year, at the rate of 50-65 mm per month. May is the wettest month (but don't let this put you off - it is also the most beautiful month) and July is the driest. April is often dry, however, the rainfall pattern is unpredictable from year to year and considerable variations have been recorded even within the Parc. The average annual rainfall is 700mm. This is considerably less than Sydney's 1200mm, which is generally regarded as rather wet for an Australian city, but on a par with London's 750mm - also generally regarded as a rather wet city. This can be explained by the fact that in London it so frequently drizzles rather than really pelt it down, leading to many more inclement days in order to deliver its quota. Some people may not have ever seen "'Allo 'Allo", which is a pity. I have a nasty feeling that this may be how I sound to French people. La Claise rises just south-west of Chateauroux and flows through the Brenne. It joins the Creuse near Descartes. 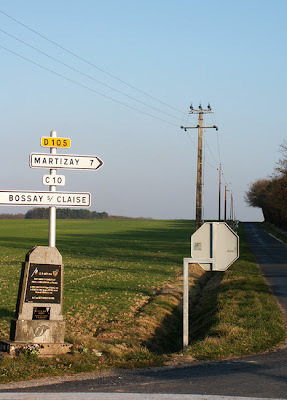 Along its way it passes through Mezieres, Martizay, Bossay-sur-Claise, Preuilly-sur-Claise, Chaumussay, le Grande Pressigny and Abilly, for a total distance of 86km (53 miles), and drains an area of 1123km². It isn't one of the grand rivers of France, being fed mainly by rainwater in an area with a lower than average rainfall when compared to the rest of France - and indeed to the rest of the Loire Basin. On the other hand, it has been known to flood, most recently in 1982, which is when its greatest ever flow was recorded. For most of the time the river moves very gently. There are a lot of mills and weirs built along it, and it is these that actually turn it into what looks like a proper river for most of the year. If it wasn't for the pools created by these obstacles, I imagine the river would look more like a stream during summer*. There is a weir just below the Plan d'Eau which is responsible for the width of the river as it flows through Preuilly itself. *The exception to this would have been the summer of 2007. Just ask my parents! I know that cheese isn't the best thing to use; raisins, peanut butter and chocolate are all better. The French don't do peanut butter - you never see it in the supermarches except in the import section, next to the £3 minature jars of marmite. So what do the French use on mousetraps? The main part of the Brenne is fairly flat. The altitude here is about 100m above sea level. There is a line of buttons running east-west from Méobecq passing through Migné, Rosnay and Douadic. These slightly higher spots are between 115 and 125m, with the highest at the Chateau du Bouchet (near where the Maison du Parc is situated) being 133m. The slopes from the Chateau run down to the River Creuse in the south and the River Claise in the north. Once across the Creuse in the south, the land starts to rise little by little, towards the Massif Central. 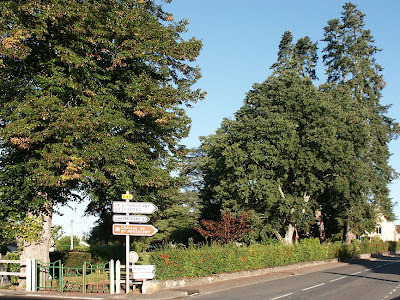 At Tilly, the most southerly village in the Parc, the altitude is 218m. 1. Etangs - shallow (averaging 1.5m deep) stagnant water used for fish farming. These small (average 1-3ha) lakes are not naturally occurring or spring fed. The largest is la Mer Rouge (180ha). They are typical of la Grande Brenne, also known as the 'Land of a Thousand Lakes' (at last count there were in fact 2237 étangs and the number is increasing). The Parc's success, leading to an increase in the number of étangs, many of them privately owned, stocked and managed on a more modern commercial (ie intensive) scale, is not without its problems. Etangs are arranged in series and emptied one into the next, requiring considerable planning to manage when a number are to be emptied into catchment areas in close proximity. 2. Rivers - three rivers cross the Parc from east to west. a) The Claise - to the north it is chalk and sand, to the south, clay. The river is greatly controlled with 22 weirs between Luant and Martizay. The flow of water at Martizay in the summer is 100l/second. The Claise flows into the Creuse in Indre-et-Loire (ie outside the Parc). b) The Creuse - a rather large valley carved out in the Quaternary Era, which today flows across the marine carbonates (limestone) known as the Mid Jurassic Dogger series in the Parisien Basin. The word 'creuse' means 'crease'. 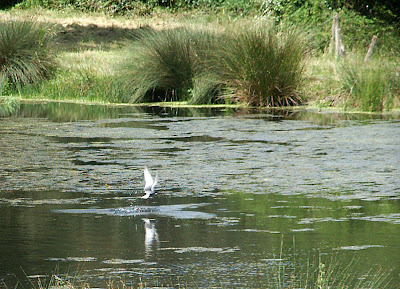 The flow in summer at Scoury is 2m³ but is dependent on what is released at Eguzon. 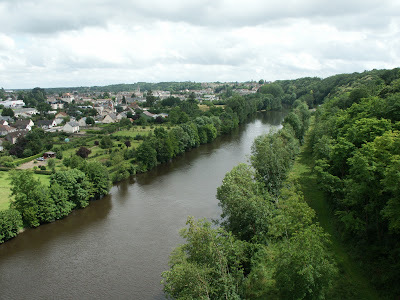 c) The Anglin - upstream the riverbed is a geological coating of igneous* rock, whereas downstream the substrate is limestone, with a flow of 810l/second in summer at Mérigny. 3. 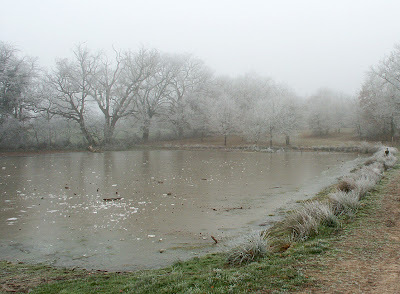 Ponds - these are small reservoirs, generally less than 1ha and are typical of the south of the Parc. They have a natural tendency to reduce in size but play a role in collecting and retaining surface water. 4. Springs - there are no springs in most of the Brenne, but in the southern part they are common and often responsible for the creation of wet grassland. *The 'Flore remarquarble' actually says 'La partie amont coule sur un revêtement géologique cristallin alors qu'à l'aval le substrat est calcaire,' but I was puzzled by the use of the word 'cristallin'. Many thanks to my geologist contacts for helping with this: Stu, who is English but works in France, taught me the useful phrase 'oui, c'est cristallin ça, je comprend' ('yes, that's crystal clear, I understand') and told me the story of how when the site office at the English end of the Channel Tunnel was jacked up ready to be removed it became clear that about a dozen adders had taken up residence underneath. Apparently you have never seen so many big burly guys scatter so quickly, notwithstanding that they were all wearing full personal protection gear, including safety steel cap toed boots! Thanks also to Hugh (Scottish and working in Scotland) at the British Geological Survey, who put me on to Gaud (French but working in Scotland). Of late, I have been playing with Sketchup, Google's 3D drawing thing. Not the perfect program, but a lot of fun for the money (free!). One thing that has had me puzzled is the complexity of the roof in the barn - what goes where, how the load was spread - and what all those pieces do. 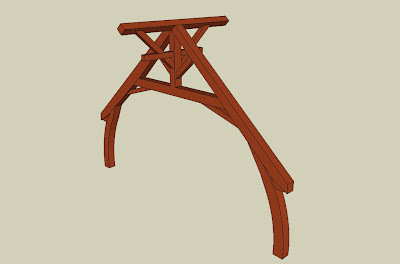 Making a model in sketchup has actually helped me a lot with this. Not only have I looked properly at the photos, quite possibly for the first time, but it did allow me to work it out piece by piece. Susan took a look at this photo and said "It looks kind of Alpine", and she is right. It could be the ornamental (if slightly delapidated) facade of the neighbour's garage, or maybe just the fact that the telephoto lens makes the hill look steeper. Whatever the cause, we are hoping that this will eventually be the view from our bathtub. On a completely different note, we received an email from Alan to say that my faith in my deductive powers is justified - the Tour de France will indeed be going through Preuilly on the 9 of July. I am excited, even if no-one else is! The natural habitat that exists today is the result of climatic and geological action over many thousands of years. It is also the result of man's exploitation of these natural features. The land can be divided into three categories: the forest, cultivated land and the étangs (lakes). a) The Forest - it was towards the end of the Roman period that the deforestation of this once very wooded land began. This was related to the smelting of iron, which required vast quantities of wood. Dark circles appear on the bare earth in winter, witness to the manufacture in the past. 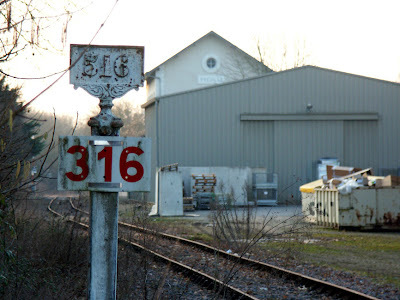 At least 75 ancient ironworking sites have been discovered in the Grande Brenne and the names of the communities reflect the importance of ironworking (Azay-le-Feron, Nuset-le-Feron). 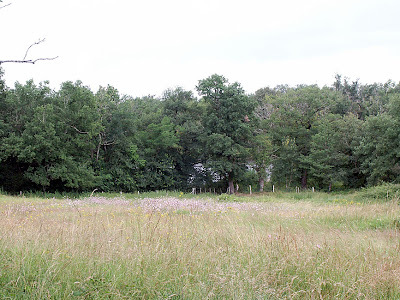 The forêt de Preuilly is one of the three principal forests of the Brenne, and I am told that ancient ironworking sites can be seen in a number of places in the forest (thanks Jill and John). The forests survived in abundance until the height of the Middle Ages. Then, little by little, they retreated, the countryside being opened up by favoured peasants granted land by the new aristocracy. This deforestation had an effect on the soil. The loss of the woodland resulted in increased erosion in winter and altered the drainage because the trees were not there to take up water. Added to that, with the soil exposed, evaporation from the surface increased, leading to soils that were dry in summer and wet in winter. The areas thus opened up were put to use for agriculture and pisciculture. There remains a significant amount of woodland in the Brenne, much of it held as private hunting reserves. The hunting of game such as deer, rabbits, boar and various birds eg woodcock, partridge, quail, duck has always been important to the area and is an extremely popular and traditional leisure pastime. You do not have to go very far in the winter to come across half a dozen parked vans, men in hi-viz vests with shotguns crooked over their arms and happily occupied dogs. b) Arable land - the Brenne has poor soil compared to the areas to the north (around Valencay and Chatillon sur Indre and between the Loire and the Seine, around Chartres). In many cases, some agricultural practices have contributed to the impoverishment of the soil (burning, grazing), causing an expansion of the heathland. Nevertheless, the pollen record shows that land was cultivated in antiquity and that it continued right through the Middle Ages. 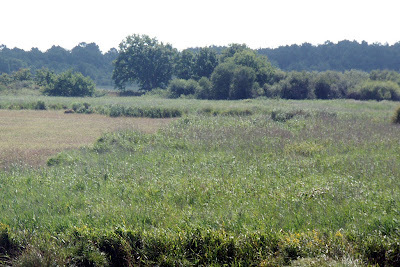 Several of the boggy areas have been studied and have revealed that around the 6th and 7th centuries the banks of the Claise at St-Michel-en-Brenne were already open countryside, put to growing cereal crops. Much later, between 1820 and 1840, the Napoleonic Cadastral system identified many small parcels that had almost all been cultivated. It is believed that the area of heath in the Grande Brenne in 1860 was 21 000 ha. c) The Etangs - the land is flat and the shallow soil is underlain by clay, with the consequence that water retention is easy. The first étangs are believed to have been built by local abbeys in the 7th century. The traditional way to build an étang involves building an earth bank or causeway that blocks a small natural valley, thus impeding the drainage of water. The étangs are emptied in series, one into another towards the same catchment basin. The oldest ponds which use this system seem to have been refurbished in the 11th to 13th centuries. Two dating techniques have revealed very interesting information. First, counting the growth rings shows a date of about 1400 for the creation of the sluicegate on the Etang des Basses Rondieres at St-Michel-en-Brenne. Second, radioactive carbon 14 dating puts the Etang du Grand Mez at Méobecq between the years 960 and 1236. Two étangs in a chain, the far one has been emptied. It seems that between the end of the Roman Empire and the beginning of the Middle Ages the area was not the immense swamp it later became, but was actually quite a wooded district. It must have had depressions, where stagnant water collected for part of the year, leading to more or less peaty marshland. It is difficult to assess today how important these areas were at the time. The real proliferation of ponds came later - perhaps as late as the start of the 14th century and continued until the end of the 16th century. With deforestation, the land had become progressively less suitable for cultivation (too wet in winter and too dry in summer), and so the area was used for fish farming. The creation of étangs seems to also be linked to the rise in the commercial exploitation of fish, notably carp, due to the distance from the sea and it seems likely that this was a response to local needs and/or changes in diet. In 1844 the Grande Brenne had around 931 étangs covering an area of 6500ha. It seems that the increase in the number of étangs lead to the Brenne becoming a somewhat unhealthy district, marshy and unsalubrious. Malaria ravaged the population. A campaign to drain the ponds and reduce the risk of malaria began in the second half of the 19th century and continued to some extent into the beginning of the 20th century. 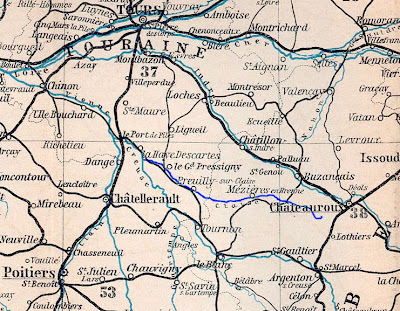 In 1920 the Brenne had no more than 191 principal étangs, covering an area of 3100ha. This drainage programme was conducted in parallel with the building of all weather farm tracks and by 1872 the Brenne was no longer enclosed and had been broken up. Today the number of étangs is again increasing and, like the forests, many are in private hands and provide leisure angling on a commercial basis. A significant number are farmed on a commercial basis, producing 1200 tonnes of fish a year, more than half of this being carp, which is sold for the table in France and Germany. 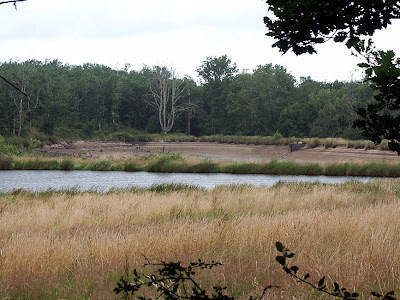 Most of the étangs are not accessible to the public, but there are a number that can be easily seen from the roadside or on nature reserves eg la réserve naturelle de la Chérine, owned by the Ligue pour la Protéction des Oiseaux. The colonisation of the flora associated with the étangs is probably relatively recent and there is much we still don't know about the history of the area.